The installation of ionCube consists of installing ionCube Loaders to Enterprise Server. Note: ionCube consists of pre-compiled modules which are therefore dependent on the operating system, the platform, and the PHP version used. Since Enterprise Server version 8, ionCube is no longer shipped as part of the Enterprise Server installation files. Instead, the recommended version is made available on the Help Center. Step 1. Download the ionCube Loader package from the Enterprise Server Maintenance page. Step 2. Extract the contents of the package somewhere on your system. Note: It is assumed here that the folder of your Enterprise Server is named "Enterprise". Step 4. Click Clear All to clear the check boxes for all tests. Step 5. Select the check box for the ionCube Version test. Step 7. Follow the steps as outlined in the test results. The Health Check page appears. This means that ionCube Loader is correctly installed. No further action is required. 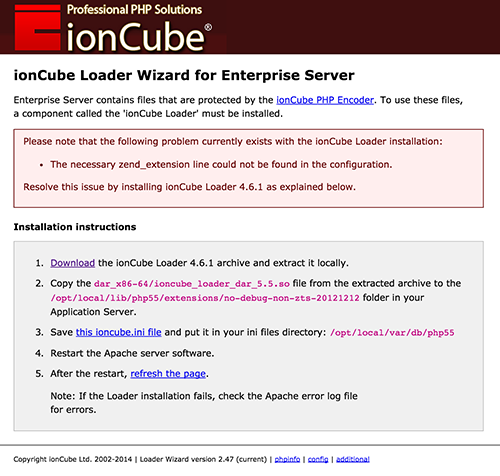 The ionCube Loader Wizard for Enterprise Server appears. This means that the ionCube Loader is not correctly installed or that an incorrect version is installed. The information provided on the page will give you an indication of the exact problem and how to resolve it. Step 4. Follow the outlined steps. Step 5. Repeat step 3 until no more errors appear.